On Thursday April 30 we took Simon Rae - author of Keras - to Cholsey School and Our Lady's Abingdon. At both schools he received a very enthusiastic welcome, and some of the best questions I think I've heard children ask an author. Simon is a poet, broadcaster, biographer and playwright. His first novel - Unplayable - was a book about cricket, but Keras (published by David Fickling Books) is a very different beast altogether. We've loved recommending the book in the shop. It's the story of a young boy, Jack, who discovers an incredible secret in the local landowner's woods - a unicorn. 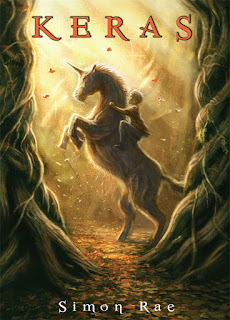 The story that unfolds is one that appeals equally to boys and girls, and is an exciting twist on the unicorn myth. The book itself is a thing of beauty, a smaller-format hardback that just cries out to be read thanks to the wonderful artwork on the cover. Simon's story as an author is one that started with a bookshop. As a boy, his parents ran a bookshop in Canterbury, so he grew up surrounded by books (and of course disappointed his parents by not following them into the business). He started out reading two extracts from the book - and then settled in to answer a wide range of questions from the children: which books did he like as a child, does he base the characters on any real people, why did he become an author in the first place? We then Whisked Simon back to Abingdon, where - unusually (because typically we're on a tight schedule) we were able to bring Simon to the shop and give him some lunch. Inevitably we asked Simon a few questions before letting him return to north Oxfordshire. The next book for David Fickling called 'The Stone Butterfly'. I'm delivering it next week for publication in February. I haven't found a bad thing about writing for children yet. The best thing is being able to write a novel and not have to include adult "stuff". Oh wow, I love the Stephen King quote about adverbs! Very eloquently put and melancholic in true King style. I've not read any of Simon Rae's work (I'm probably a little old ;) ) but it was great to learn about him here. Thanks for sharing it!